Minivans have become one of the most efficient ways to carry your family around town, or on a long road trip. Minivans have a unique mix of being able to carry many occupants and having plenty of room for your stuff. The Chrysler Pacifica is one of the most popular minivans due to its great design and performance. 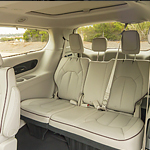 The Pacifica can be had in several different trims with different drivetrains. The most common of these being the 3.6-liter V6 Pentastar motor that will return up to 28 mpg. This is great for long cross-country road trips. The other drivetrain available is the hybrid. This marries the Pentastar V.6 with an electric motor which makes for better efficiency. The Hybrid can get up to 82 MPGe and up to 520 miles of range on a single fill-up. The Chrysler Pacifica sets the standard for all other minivans and is a great economical option if you're looking for a minivan. If the Pacifica intrigues you, take one for a test drive at Rio Vista Dodge Chrysler Jeep.